UPPSC exam schedule 2016-2017 has been released. The Commission has released the tentative examination schedule for the current year as well as for the forthcoming one. As per the schedule released by the Uttar Pradesh Public Service Commission (UPPSC), the examinations will begin from 09 August 2016, with the Assistant Forest Conservator Exam 2015. The last exam of the year will be that of Uttar Pradesh Judicial Services Civil Judge Main Exam 2016. The UP Judicial service exam will be held on 18 December 2016. 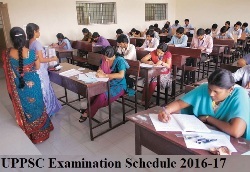 The Commission has released the examination schedule for the forthcoming year as well. In 2017, the first exam will be held on 19 February (Assistant Registrar Exam 2015). The much coveted Combined State Upper Subordinate Service Prelims 2017 exam will be held on 19 March. This exam attracts huge number of applicants every year. Lakh of candidates apply for the examination every year for the examination. Candidates aspiring to join Uttar Pradesh Public Service Commission (UPPSC) can gear up their preparation with these examination schedules.